Residents of the 89119 zip code rejoice; Pop Up Pizza is serving up fresh slices of gourmet pizza just for you. We are conveniently located the Plaza Hotel in Downtown Las Vegas, and are delivering our hand made pizza in the 89119 area right to your door. In addition to offering all the time tested favorites, we also offer a unique selection of gourmet and vegan pizzas to choose from. Try one of our signature pizzas like the Goodman, featuring caramelized onions, spinach, roasted mushrooms and red potatoes over mozzarella cheese. Order online, walk in or give us a call–whatever’s the most convenient for you! 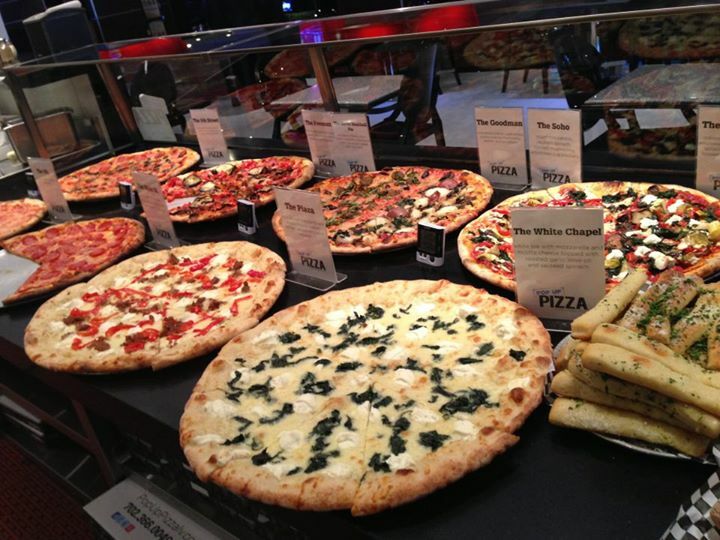 Take a break from the casinos and enjoy a slice or two at our eatery. Our establishment combines classic pizza joint décor with modern art. Dine in our intimate space while admiring colorful works by Japanese artist Takashi Murakami, or take a picture with our life-size horse lamp, a highly-unusual piece created by Dutch design team Moooi! We’re open from 11am to 2am, so stop in anytime! Call us at (702) 366-0049 and ask about how you can get a free slice of pizza after your 9th slice.